I do not play these breast cancer awareness “games.” My husband is a partner in my life, and is one of the many reasons I work hard to keep myself healthy. I don’t need to keep him – or any man – in the dark about breast cancer and the importance of screening. These are the same men who could get breast cancer themselves or may be supporting wives, mothers, daughters who do. These “games” do nothing. Has even one person gone and gotten a mammogram as a result of being “tricked” by a Facebook status message? All these games do is make people feel stupid when they find out the real meaning of what you’ve posted. I think this woman says it better than I can and if you’ve not read her blog post on the topic, you should! (In fact, she’s become something of a counter-meme herself as a result of her post!). Instead, I will post the DATE OF MY LAST MAMMOGRAM: October 7, 2011. If you are a woman who has entered the age of mammograms, I encourage you to simply post the date of your last mammogram on Facebook instead of playing those stupid “games.” THAT is the most effective reminder to other women – and men – that you can provide. I had no idea it would be so fun to run a 5 year blogiversary contest! To be honest, I thought more people would enter, but those of you who did participate did so with a gusto that brought a smile to my face many times over. So to recap, for those of you too lazy to click back and read: in 2011, all my blog posts had one deliberate thing in common. Everyone had 5 days to email me and tell me exactly how I deliberately tied all my 2011 blog posts together. Those who answered correctly via email were entered into a random drawing for a $25 Amazon gift card! Anyone who could also tell me which post did not strictly conform to the pattern got a bonus entry into the drawing. As each entry came in, I listed the person’s name and the date/time of the email in a Google spreadsheet (I am making the switch as much as possible to free and open source software with this new laptop). Participants got listed twice if they provided a correct answer to the bonus question (and in Kellie’s case, that came in the form of a later email!) 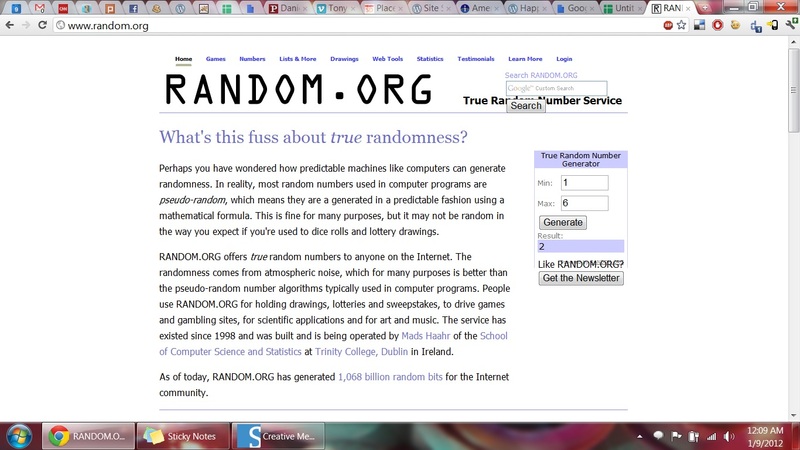 As soon as the deadline arrived, I used the True Random Number Generator at Random.org to select the winner. Debbie, I think that the answer to your blog contest is that all of the blog posts use song or movie titles as their titles. The one I see that doesn’t strictly conform (I think) is the one for “One Week,” which is perhaps a modification of “One Day,” the movie and book. Of course, there may be a deeper hidden answer to this question; if I’m completely off base, let me know. Congrats on reaching five years with your blog! Ah, a deeper hidden meaning – she knows me better than I thought! I was tickled that she nailed the fact that all my posts were song titles. However, “One Week” is in fact a song title, albeit not a sing I really KNEW. It was harder than I thought to make every post a song title! Rebecca was next to answer. She and I both attend Trinity Lutheran church and I didn’t even know she read my blog! But again, we are connected via Facebook, too, and I’m guessing that’s where she saw my post about the contest. Debbie, I’d like to amend my entry — I suspect the nonconforming blog title is actually “For Emily, Whenever I May Find Her,” which is actually “Wherever.” I realized that last night while thinking about Simon and Garfunkel, thanks to your blog contest. Doh! That was an unintended mistake on my part! Kudos, Kellie – and you earned yourself an extra contest entry for that astute observation! Lyn was the next one to jump in. She and I met through a mutual acquaintance, who happens to be her husband Stephen! All of the titles of your blog posts are song titles. I had to look some up. J For the bonus entry: Let’s Get Physical is the title, not Let’s Get (a) Physical PS. Can you confirm the email address is right. The post has dschinker dot gmail dot com and I’m guess you meant @ gmail. Oops! Thanks for finding that mistake, Lyn. The (a) was meant to indicate a deliberate twisting of the title, so technically no bonus entry for you, but I gave you one anyway, for catching my typo. 2. Back to the Future is the only instrumental. 4. “End of the Innocence?” — the actual song title is “The End of the Innocence”. As for “didn’t strictly conform to the pattern”, I would have to say Ch-ch-ch-choices doesn’t conform if the pattern is titles, and Back to the Future is the one that doesn’t conform is the pattern is songs. The title “Ch-ch-ch-choices” was actually made BEFORE I decided to title ALL my blog post entries for songs, so that one was the anomaly I actually had in mind. And I must point out that my biggest blog supporter, dear husband John (who was excluded from this contest and was none too happy about it, either!) did tell me today that the title of THAT song is actually “Physical.” Now you know – and so do I! I truly appreciate everyone who reads my blog, and by extension hears my voice. I appreciate the opportunity to think and write – especially for an authentic audience – and to talk things through with you, my readers, be you friends or strangers. Happy birthday, Midnight Musings, and here’s to 5 more years! I’d like to wish my blog, Midnight Musings, a very happy 5th birthday! Five is auspicious – this digital child of mine is a whole hand old now and frankly no one is more surprised at its staying power than I! I’d like to sincerely thank my husband John Schinker for encouraging me to give this blogging thing a try way back in January of 2007. I never imagined so many people would read my words or care about what I had to say. So I’d also like to thank YOU, my readers, for breathing life into this site by reading, sharing, and commenting. I am truly flattered and honored by your attention. Now that I’m a mother, I find curiously amusing the tradition of giving presents to the child on the day when the child did nothing and the mother did all the work. Really, its our MOTHERS who deserve presents on our birthdays! Since the only present my blog really wants is more posts and more readers, I decided long ago to give you, my readers, a gift for my blog’s birthday, but you do have to work for it just a little bit. So here’s the deal: in 2011, all my blog posts had one deliberate thing in common. You have 5 days (until midnight my time on Sunday, January 8th) to email me at dschinker at gmail dot com and tell me exactly how I deliberately tied all my 2011 blog posts together. Anyone who answers correctly VIA EMAIL (no spoilers in the comments please – I will just delete them!) will be entered into a random drawing for a $25 Amazon gift card! You get a bonus entry into the drawing if you also tell me which post did not strictly conform to the pattern. I believe I have only 5 faithful readers, and John is exempt from winning, so your chances are pretty darn good! A New York City subway train holds 1,200 people. This blog was viewed about 5,800 times in 2011. If it were a NYC subway train, it would take about 5 trips to carry that many people. Seventeen years ago today was one of the very best of my entire life so far. Seventeen years ago today, October 22, 1994, I declared before God and family the commitment I’d already made in my heart on New Year’s Eve 1992. 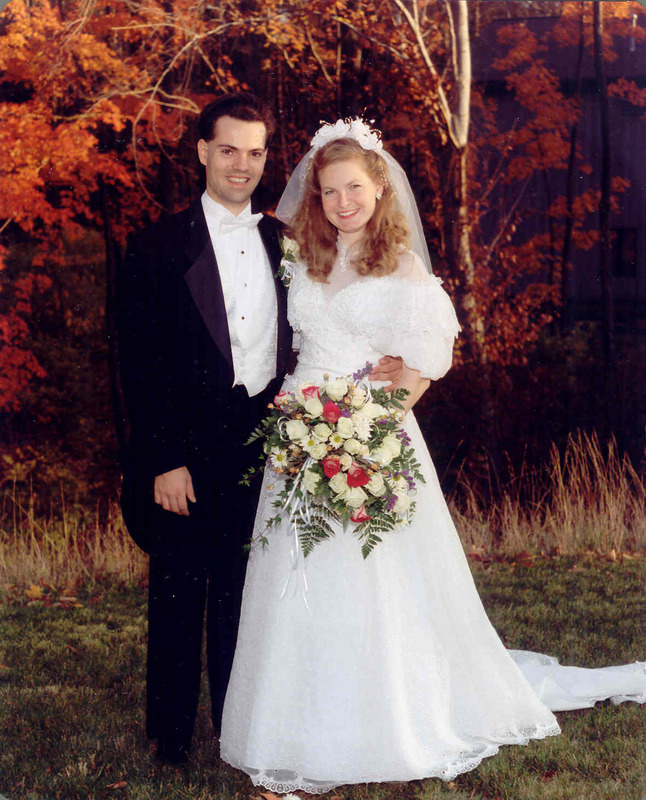 Seventeen years ago today, I married my very best friend. When he asked me to be his wife, it was unplanned and completely from the heart. When I said yes, it was a rare triumph of heart over head for me. I clearly and distinctly remember my brain processing the question and thinking, “What?! Not time! Too soon! Not planned! What if…? !” and my heart interrupting with just one word, the only word, the right word which, when spoken, instantly shocked and silenced my head: YES. It hung in the air and left both our heads and hearts alike breathless and wondering what had just happened, what had just been said, what had just been agreed. Yet we both knew it was right and forever. We kept it secret for 10 months from all but our single best friends. It had been sudden, yet 2 years and 9.5 months in the making. And even the f0llowing fall when he made it socially official with the traditional ring, some were shocked, surprised, and thinking it was too soon. But we knew, he and I, and we couldn’t wait! We wrote our own vows because it just seemed right to do that. Sadly, the envelope with the original vows written in our own hand was lost in the whirlwind of the day. Years later, I listened closely, over and over again, to the wedding video and painstakingly transcribed those vows into our wedding album so we’d be able to read them and remember them always. They are as true today as they were then. I’m still working on fulfilling mine in the way he deserves, even though I fall short in so many ways. He has fulfilled his and continues to make them true every day. Our wedding day was AWESOME! We thought about so many details to make the day meaningful for us and fun for our guests. We planned and planned – together – and it went off with only few smalls glitches, like a dropped and broken unity candle (apparently NOT some kind of bad omen). My only real regret that day was the damn fake flowers in hideously unnatural rainbow hues, but hey – everyone needs something to go wrong so there’s a good wedding horror story to tell in later years. Although it was expensive and I had to fight to make it happen, I am so very glad we have professional video from the entire day, from getting ready with my bridesmaids at home to getting to the church to taking pictures to the reception. Although the videography seems amateurish now with transitional effects that make me cringe, I still watch it every year. I cry at the sight of people in attendance who are no longer with us, I laugh at the me I used to be, and I giggle at the sheer silliness. I never imagined watching it with my own kids, but I do and they love it as much as I do. Mostly, I love the LOVE and fun of it all. And I still dearly love that man he was and is now. Some people think marriage doesn’t matter, that it’s at best an unnecessary social formality and at worse a misogynistic patriarchal artifact. But words DO have power; traditions DO have meaning; public declarations of commitment in front of those we love, toward whom we feel a sense of respect and admiration and responsibility, creates a new kind of bond and cements the foundation that under-girds a very vibrant and ever-changing relationship. We’re not exchanging gifts today. Some years we do and some years we don’t. For our 15 year anniversary we went on a cruise to the Bahamas that he reluctantly agreed to on our 14th anniversary. I told him that it was such an amazingly fun trip that it could even count for this year’s anniversary (pretty good return on investment, getting credit for 4 anniversaries from a single three day cruise, donchya think?). But really, what gift could ever compare to the one he gave me 14 years ago: the gift of his heart, soul, and love? When he went to Africa for 6 weeks in 2009, I knew I’d miss him, but I never EVER expected it to be as hard as it was to live without his physical presence every day. We’d not been apart for more than a week before he left and I told him afterward that never again would we be apart that long. He’s just too much a part of my very self, more than I ever realized, for me to feel whole for long without him. Three days ago, I read about a couple who was married for 72 years. She was 90 and he was 94 and sadly, they were together in a car with him driving when he pulled out in front of another car at an intersection and were hit. They were rushed to the hospital and put in the ICU together, basically non-responsive, but yet holding hands. They died an hour apart – to the minute – still holding hands. Their children said that’s how their parents would have wanted to die – together – because one wouldn’t have wanted to live without the other. I completely understand. So happy 17th wedding anniversary to my best friend, my soul-mate, my sweetie, my children’s father, my lover, my husband, my delight. To John. Here’s to a lifetime more memories together because after 17 years, we are just getting started!